Ensuring the security of buildings and facilities is paramount, and one of the cornerstones to any truly effective security program is the mechanical key system. These systems continue to be the most economical solution for establishing access control within a facility. However, mechanical key systems also have inherent challenges making them difficult to manage and maintain over time. Each mechanical key system is flawless the first day of installation but through day-to-day operation and continual interaction of locks, keys, and key holders which all change over time, the key system’s accuracy can degrade quickly, compromising security and operational efficiency. All mechanical key systems begin with key cutting and cylinder pinning records detailing the mathematics and hierarchical organization of the locks and keys. Next, these records become integrated with tracking locations, doors, locks, and key holder information. The Key system’s integrity, accuracy, and expansion are all dependent upon the records created during design and how well they are maintained throughout their life cycle. Many manufacturers offer stand-alone key tracking software programs intended to be loaded onto specific computers within the System Owner’s organization. However, the responsibility for entry, accuracy, and maintaining key system data in these records management applications falls largely to the System’s Owner. This stand-alone solution also can be problematic in relation to operational support, upgrades, maintenance, or expansion of the key records software. With improved network and cloud technology, a better solution has been developed to enhance the System’s Owners accuracy and efficiency eliminating this stand-alone philosophy. A Cloud Based Software Solution designed for Key Control. 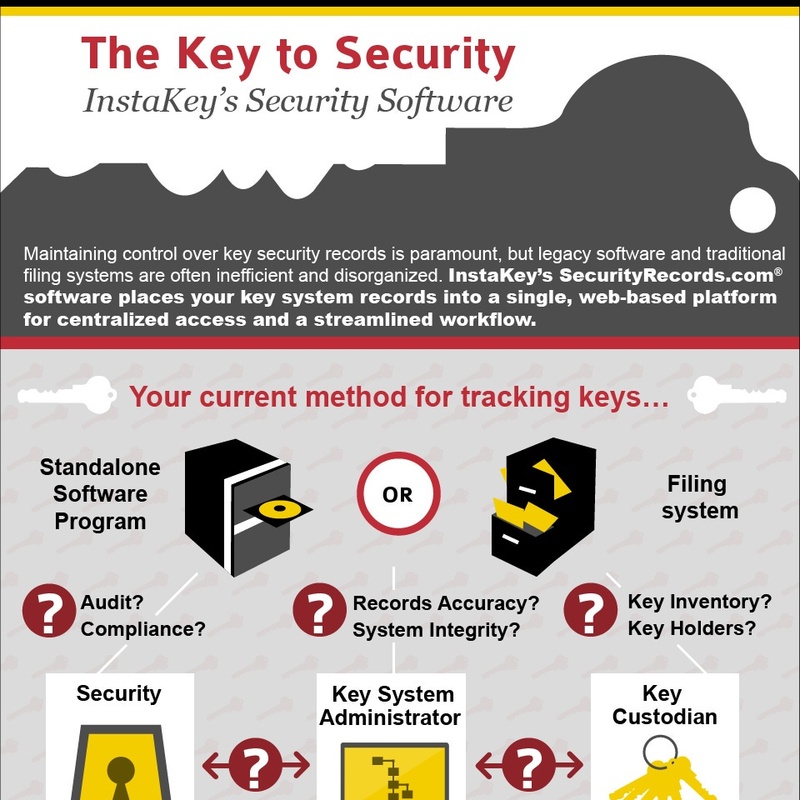 InstaKey® Security Systems believes key system records are critical to establishing manageable key control. No matter what lock hardware a System Owner utilizes, InstaKey® Security Systems has developed the only web-accessible, relational software program specifically designed to simplify key system management. The SecurityRecords.com® key tracking software allows System Owners to track and monitor the real time status of their mechanical key systems. SecurityRecords.com® is a cloud based environment, so access to the key system data can be dispersed to any authorized personnel on any web accessible device. This allows for de-centralization of responsibilities to multiple authorized personnel eliminating the reliance on any one specific department or individual. Access levels are also customizable to allow authorized users various capabilities from full administration and ordering, to simple lookups and auditing through the Key Control Dashboard. This secured cloud based environment also eliminates the need for software installation, upgrades, stand-alone support, or hosted computer security. System Owners are now able to efficiently delegate administrative responsibilities relevant to the key system records to subordinate personnel or even ancillary departments. This streamlining of operations allows for better focus on the global management of the key system’s integrity and performance. Through utilization of this software program, System Owners have historically been able to sustain their system’s security, better their cost reduction, improve their operational efficiencies, and prolong their system’s life cycles.